A decade has passed since I identified the need for www.musites.com. At the time there was nothing on the internet that could satisfy a need for easy access to interesting music web sites. So I created musites.com (launched 20/10/99) and for a brief moment, it was good. Sadly, times change and Musites.com has now been taken offline. My timing was sublime – a few weeks before I launched musites.com, a new search engine called Google came along and within a matter of years was finally providing me with a suitable way to search for websites that actually had some relevance to the music I was looking for. 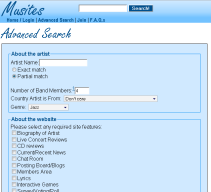 Musites still offered something a bit different, with un-rivalled meta-data about the sites and artists in its database. However, with plenty of other things to occupy my time and no way for a hobby site to compete with the corporate alternatives, the Musites database filled up slowly and never reached a level where it could be a sensible idea to use Musites.com rather than Google. A little site refresh a few years after launch made sure that the site kept up to date with modern web standards but it wasn’t going to help with the fundamental problem that no-one would choose to use it over Google. In more recent years, sites such as last.fm have now begun to offer up the sort of music meta-data that I was dreaming of in 1998 and a tiny music database populated with 200 websites (mostly from 99/00) looks rather laughable in comparison. So, considering that for some years now, even I would not consider using Musites.com to find websites about music, it seems only fair to remove a bit of superflous information from the internet and (though they are few in number) the actual human beings that do occasionally find themselves at Musites.com will no longer waste time at a resource that is extremely unlikely to be of any use to them. My main web hosting contracts have always been based on the musites.com domain name and all my email addresses are too, so the name isn’t dissapearing overnight but the website itself is now offline. Thanks again to everyone that helped me get it set up in the first place.